As expected, here's the ECHL logo map. We thought the Heat had it rough in the AHL, but they've got nothing on the Alaska Aces. It's great seeing a pro hockey team in Alaska, but the money they must spend on travel! As for the rest of the league, there's a clear divide between east and west. A 1,600-mile divide, actually. The Great Plains are completely devoid of ECHL action. 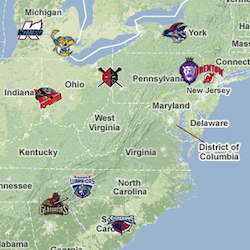 But the map will fill in a little bit next season when a new franchise begins play outside of Chicago. And because there are only 19 teams, there aren't too many clumps — the closest teams are in Reading and Trenton. It's also surprising to see Canada is only represented by a single team. Shame. But the ECHL is home to my closest team, geographically, the Florida Everblades.